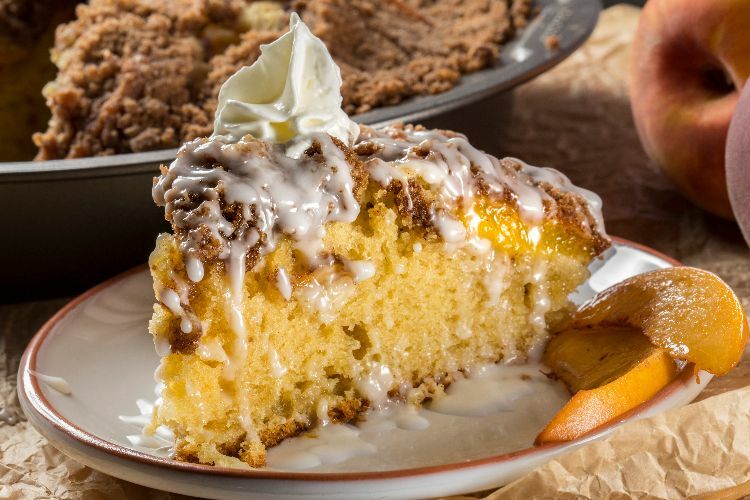 A multilayered Southern peach crumb cake is a delicious treat to enjoy with coffee, and this recipe is incredibly easy to make. The sour cream cake base is topped with a layer of fresh sweet peaches and a spiced layer of buttery crumbs. 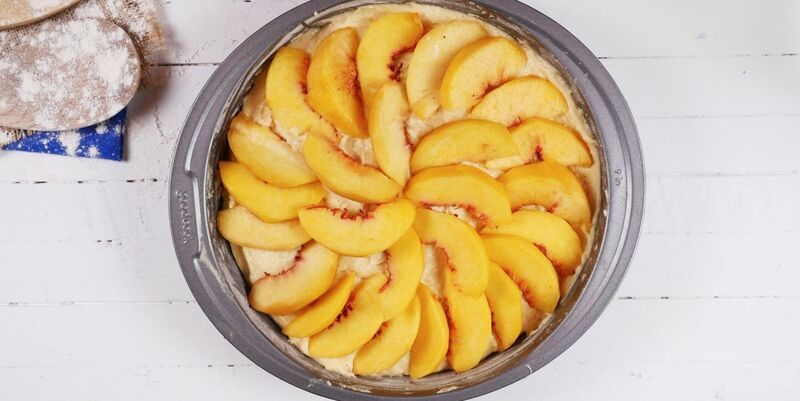 This cake is just as delicious when made with fresh peaches as with canned, so you can enjoy it all year. In a medium bowl, sift together the 1-1/2 cups of flour, baking soda, baking powder and salt. In a large bowl, beat together the sugar and butter until light and fluffy. Beat in the vanilla, followed by the eggs, beating well after each addition. Use a rubber spatula to fold in about one-third of the flour mixture, followed by half of the sour cream. Fold in the second third of the flour mixture, the remaining sour cream, and finally the remaining flour mixture. Spread the batter into a floured and buttered 9-inch round pan. Arrange the peach slices over the top. Combine the brown sugar, 1 cup flour, cinnamon and salt in a bowl and mix until well-combined. Drizzle in the melted butter and mix with a rubber spatula until evenly moistened. Use your fingers to break the mixture into crumbs, and scatter them over the top of the cake. Bake for 45 to 55 minutes, until a cake tester inserted in the center comes out clean.